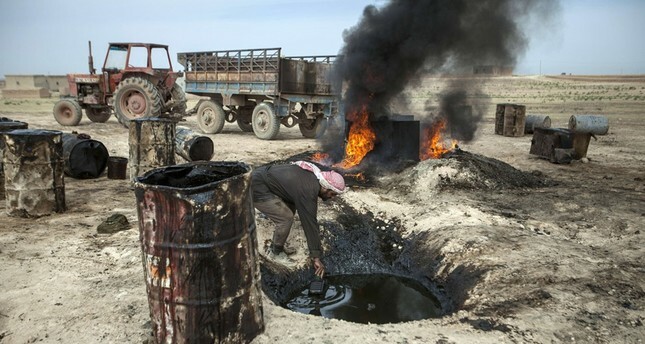 The U.S. exerted new pressure on the Assad regime and its Iranian allies this week by sanctioning key businessmen associated with the regime and forcing the Syrian Democratic Forces (SDF) to sever their oil deals as well as trade ties with Damascus. Daily Sabah has learned that the U.S.-backed SDF terminated its oil trade with the Assad regime and restricted transportation to regime-held areas on Wednesday. Bassam Barabandi, a former Syrian diplomat based in Washington with extensive ties in Syria, said that the SDF has also closed all crossings to regime territory except As-Salhiyah. Colonel Sean Ryan, Spokesman for the U.S.-led military coalition, dismissed the reports that the SDF had blocked roads leading to regime-held areas. "I'm not sure if that is accurate as the SDF is very busy preparing their plan to liberate the areas in the lower Middle Euphrates River Valley, and free the citizens in the Hajin area from Daesh. If any roads are blocked, it is probably part of the military operations," he said. Sources suggested that the Trump administration has decided to toughen up against Iranian networks in the country as U.S. forces continue to build permanent military bases and move sophisticated satellite systems along with new air defense platforms in northeastern Syria, a sign that Washington isn't leaving the country any time soon. The U.S. Treasury Department on Thursday designated Iran-backed Syrian businessman Muhammad al-Qatirji, (known as Hossam al-Katerji) for facilitating fuel trade between the regime and Daesh. Ironically, Qatirji has been continuing to conduct oil trade with SDF-held areas where significant U.S. military presence also exists. Barabandi said oil and grain trade conducted by Qatirji was one of the main sources of income for the SDF. Riam Dalati, a BBC Syria Producer, also confirmed on Twitter that the Katerji Group has been shipping grain and oil from SDF areas to regime territories. He reported last January that Qatirji established a new company to operate mostly in oil-rich Hasaka and Deir el-Zour following an alleged secret deal with Qatirji and the SDF. He said the company, which was solely established for his venture, was Arfada Petroleum, a $2 million-dollar initiative specialized in buying, selling and transporting hydrocarbons as well as drilling, fixing and maintaining oil wells. With the appointment of Iran hawk Ambassador James Jeffrey, Washington seems to have targeted the Assad regime's economic lifeline by withholding crucial energy resources that could have a significant impact on electricity production and distribution in Damascus. "We're no longer pulling out by the end of the year, we're going to stay until we have an enduring defeat [of Daesh]," Jeffrey told journalists on Thursday. As a sign of their intention to create a more unified and stable governance under U.S. rule, the Syrian Democratic Council, a civilian branch of the SDF, declared the same day that along with local city councils they had established an "Autonomous Administration of North and East Syria", whose headquarters would be Ain Issa. The so-called administration underlined its multi-ethnic framework by referencing the presence of Arab tribe dignitaries among their ranks. The Trump administration, it seems, has also assigned Ambassador Bill Roebuck as a de-facto coordinator for rebuilding and re-stabilization operations in SDF areas. Roebuck has been visiting local administrations and having meetings with YPG proxies for the last couple of weeks. A State Department spokesperson said Roebuck was currently serving as a senior advisor in the Office of the Special Envoy for the Global Coalition to defeat Daesh. "In this capacity, he has made frequent trips to northeast Syria to meet with a wide variety of local partners to discuss the campaign to defeat [Daesh] and humanitarian and stabilization assistance that continues in liberated areas," the spokesperson said. The spokesperson, despite Trump's previous comments on his willingness to quickly exit from Syria, insisted that the new U.S. policy to stay in Syria until Daesh is defeated will remain. Turkey perceives the SDF as an extension of a terror group. The SDF is largely led by the People's Protection Units (YPG), a Syrian armed wing of U.S. and EU-designated terror group the PKK.